Unlike some healthcare specialists, a physician is frequently visited by their existing patients. Therefore, you need a physician marketing strategy that doesn't just focus on acquiring new patients, but also on retaining them as loyal promoters. To elaborate further, it requires efforts through both external as well as internal marketing activities. The external activities of digital marketing for physicians include the ever-important 'SEO for doctors' solution which helps your practice stay on top of search results and your patients' minds. The internal activities are focused on integrating your physician marketing efforts with your patient experience. Our customized digital marketing solutions help physicians acquire more patients from the internet, and provide them with a seamless experience throughout their patient journey which ensures high retention of your patient base. GMR will survey your patients immediately after their visit and ensure you're properly monitoring and improving patient experience. 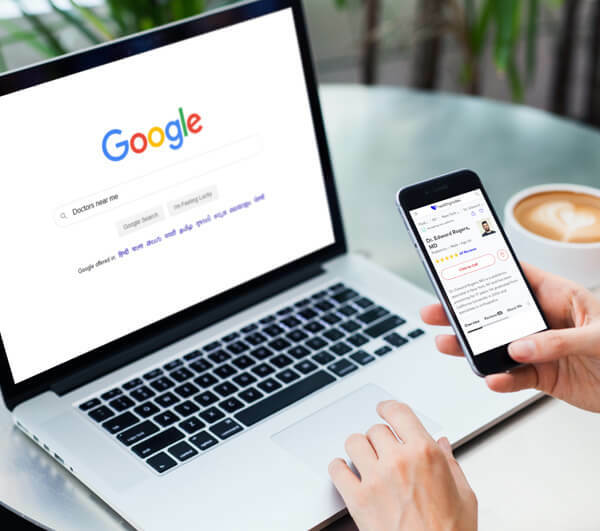 GMR's proprietary software will ensure that your online reputation is unharmed by potentially unhappy patients, and also ensure that positive reviews are consistently posted on relevant review sites. Along with building the first two pillars for you, we'll heavily focus on what is likely the most daunting task for any healthcare provider : digital marketing. We’ll ensure you’re easy for potential patients to find and that it’s even easier to schedule an appointment with you. A user-friendly website, high-quality and quick phone and email service, and even the post-visit communications, are all accounted into the patient experience. However, still the major part of a patient’s experience is decided during their face-to-face interaction with you and your staff during their visit. As part of our physician marketing strategy, we provide our proprietary sentiment analysis tool to physicians which helps them understand their patients' emotions and where their experience could’ve been improved. This way, it provides an opportunity to reach out to unhappy patients, understand their concerns, solve their issues immediately, and retain them for a long-lasting relationship. What's more – the tool also facilitates your happy patients to write and post positive reviews that improve your online reputation. Patients are continually accessing the web to gain more information regarding their health care, which includes selecting a treatment center or primary care provider. According to Google, patients visit at least 12 different sources on an average before picking a provider. A higher internet visibility improves the chances that during this journey, your patients must interact with your content on those twelve sources. A more frequent interaction helps in influencing your patients' decision-making in your favor. As a full-service physician digital marketing agency, we are equipped with all the resources that are required for helping you achieve a robust internet presence. Creating a conversion-driven, marketing-smart healthcare website, helping it rank on search results, building and managing your online reputation, managing your patient community on social media, advertising on the web, and developing and marketing the content – we can do everything for you with little effort needed from your end. We are not just equipped with the right resources, but with the right physician marketing professionals who know how to make all of these resources work together synergistically to improve patient acquisition. We are Specialists in Primary Care Physicians Marketing! Across all the physicians that we’ve been working with for over a decade, a good percentage of them are specialists in primary care. That's why we call ourselves experts in primary care physicians marketing. Having learned that most primary care patients like to stick with just one provider for all their usual healthcare needs (see the statistics on the right), we've developed a comprehensive digital marketing strategy for primary care physicians that focuses on improving patient retention by integrating all our digital marketing efforts with the need to improve overall patient experience. 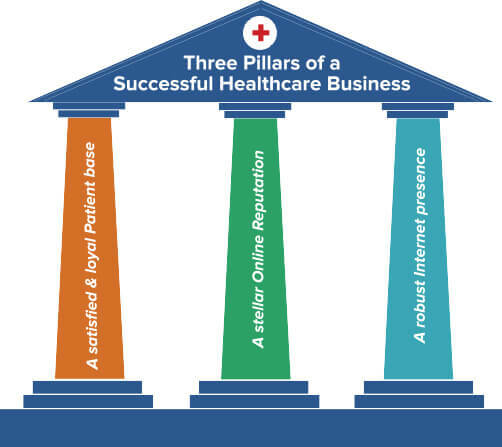 See our 3 pillars strategy further up this page. The idea is to let your patients feel cared for in order to increase the number of referrals you receive from them. Our track record of exceptionally improving patient acquisition for a number of primary care practitioners and other physicians establishes us as a trusted figure within the physician marketing space. Read the case study of one of our most loyal clients, Newport Family Medicine, to learn how we helped them get a huge 435% increase in total monthly traffic, and a 179% increase in tracked phone calls. Find out how your website compares online with your competitors.